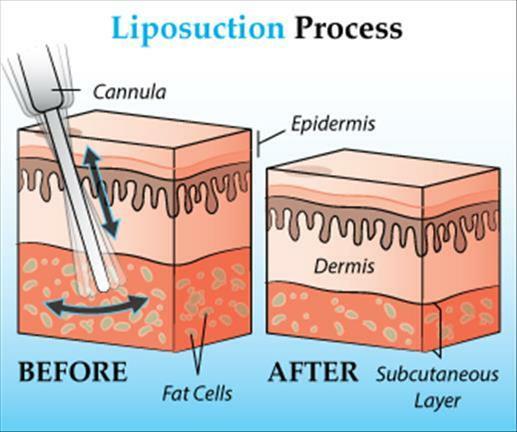 Liposuction, also known as lipo-plasty ( fat-modeling) by patients. This procedure can slim and reshape specific areas of the body, by removing excess deposits by changing the body contours and proportion. Liposuction can be accomplished along with other plastic surgery procedures, such as breast reduction, tummy tuck, and facelift. Liposuction is not a substitute for proper diet and exercise. It is not a treatment for obesity either. Various factors restrict the amount of fat that can be safe. Finally, the operating physician and patient make the decision. There are negative aspects of removing too much fact, Unusual lumpiness and dents in the skin can be seen in patients who’s liposuction has been over done. While some people are getting more than 50 pounds (20kg or 4 stone) removed, the contouring that is one with liposuction may make patients appear like they have lost more weight than the actual amount removed. The procedure may be performed under several, regional or local anesthesia. The safety of the option equates to the quantity of tissue removed; the choice of anesthetic and patients depends on the overall health. It is ideal the patient be as fit as possible before the procedure and not to have been smoking for several months. The removal of large deposits of fat is a very complicated and potentially life-threatening procedure. According to the American Society of Plastic Surgeons defines “significant” in this context as being more than 5 liters (around 10 .5 pints ). Often liposuction is performed on the abdomen, arms, thighs, and buttocks, chest and flanks in men. The American Society for Aesthetic Plastic Surgery Liposuction was the most commons plastic surgery procedure performed in 2006 with 403, 700 patients in 2011 with 1, 228 million patients. Not everyone is a good candidate for liposuction. Again liposuction is not an alternative to a healthy diet and exercise. To be a good candidate for liposuction on must be in general good health and be over the age of 18. This person should have a diet and exercise regiment, with fatty pockets of tissue available in certain body areas. Significant disease limiting risk weighs against the eligibility of a person who wants to get the procedure. In order people, the skin is usually less elastic and limiting the ability of the skin to quickly tight around the new contour. Liposuction of the visceral fat should not be coupled with simultaneously with a tummy tuck procedure because of the higher risk of complications and fatality. In Florida it is is illegal to combine both operations of an upper abdomen liposuction and abdominoplasty. The challenge of any liposuction procedure is to extract the right amount fat from the body. The surgeon attempts to cause the least amount of disturbance, of neighboring tissue, such as connective tissues and blood vessel. The doctor tries to keep the patient’s fluid balance undistributed. The surgery should also cause he least amount discomfort to the patient. As medical advances continue to change and refine many ideas of how liposuction can be conducted and make it safer, less uncomfortable and more efficient. The makes it harder for consumers to determine the truth from exaggerated claims. In general, fat is removed via a hollow tube called a cannula and aspirator, a suction device) Liposuction procedures can be categorized by the quantity of fluid injection and by the mechanism in which the cannula works. Suction-assisted liposuction (SAL) is the conventional method of liposuction. In this procedure, a small cannula, the size of a straw is inserted through a small cut. It is attached to a vacuum device, The surgeon pushes and pulls it backward and forward in different motions, careful through the layer of fat, breaking up fat cells and drawing the out of the body through suction. In this form of liposuction (UAL), a specialized cannula is which transmit ultrasound vibration within the body. These waves burst the walls of the fat cells by emulsifying or liquefying e fat cells making them easier to suction out. UAL is a preferred choice for liposuction in more fibrous parts of the body, such as the upper back or male breast area. UAL typically takes longer to complete than traditional liposuction, but shorter than tumescent liposuction. There is slightly less blood loss. With UAL, there is a higher risk of seromas forming, which are pockets of fluid, which need to drain with a needle. After an ultrasonic liposuction, it typically necessary to perform suction-assisted liposuction to remove liquefied fat, or deposits of additional fat cells, to create more volume when it needed. Back in the 1980s and 1990s, ultrasound assisted liposuction procedures were linked to cases of tissue damage, due to the excessive exposure to ultrasound energy. Third generation UAL devices address this problem using pulsed energy delivery in a unique way that enables surgeons to remove excess fat safely. Power assisted liposuction (PAL) uses specialized cannula with mechanical movement. This allows the doctor not to have to make as many manual movements. This procedure is similar to a traditional SAL. Twin cannula assisted liposuction (TCAL or TCL) This operation uses a tube within a tube the cannula pair so that cannula which aspirates or liquefy fat. the mechanical alternated inner cannula does not affect the patient’s tissue or the surgeon’s joints with each forward stroke. Within the slotted outer cannula, the liquefying inner cannula reciprocates to simulate a surgeon’s stroke up to 5 cm (2 in) rather than just vibrating 1-2mm (1/4 in) like other powered assisted devices. This simulation removes most of the manual labor for the surgeon in this procedure. Superficial and subdermal liposuction is conducted by spacing the outer cannula and the fact that cannulas do not get hot, which reduces the risk of friction burns. External ultrasound- assisted liposuction (XUAL) is a type of UXL in which ultrasonic energy is applied externally from outside the body, through the skin making a specialized cannula of the UAL procedure unnecessary. Since UAL can skin necrosis (death) and seromas, in which pockets of pale yellowish fluid from inside the body, as well as analogous to hematomas ( pockets of red blood cells), doctors developed XUAL to prevent these things from happening. XUAL is a way to avoid these types of complications. Having the ultrasound applied externally can lead to less discomfort for the patient during the procedure and recovery; decreases blood loss; treat larger areas, and grant better access to the scar tissue. However due to study inconclusive results this procedure is not widely used. Water-assisted liposuction (WAL) uses thin water beam in the shape of a fan, which loosens the structure of the fat tissue so that a special cannula can remove the fat. During WAL, water is continually added and is immediately aspirated through the same cannula. WAL needs less infiltration solution and creates less immediate edema from the tumescent fluid. Laser Liposuction uses an a laser to melt fat in a designated area, making is much easier to remove. The laser is delivered via a fiber threaded via a microcannula. The idea is based on UAL. Doctors believe that laser techniques reduce bleeding and bruising as it cauterizes the tissue to some extent. 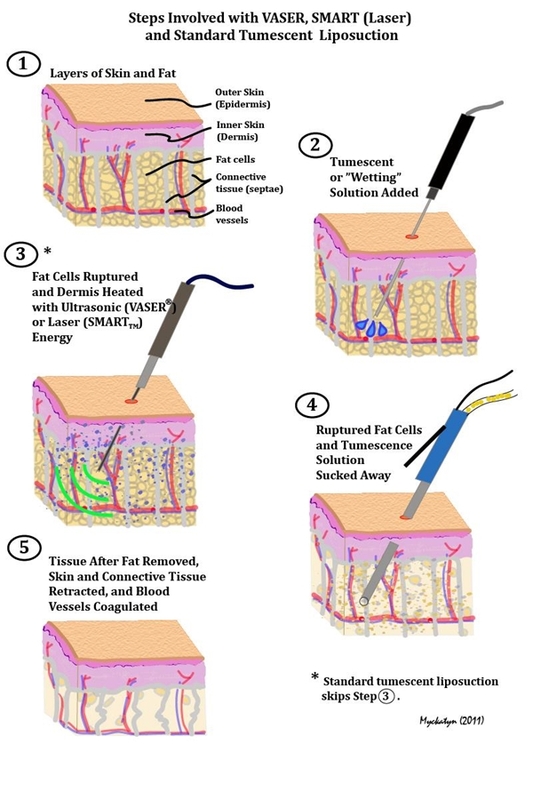 Tumescent liposuction provides the patient local anesthesia to large parts of subcutaneous fat and allows liposuction to be implemented with only through local anesthesia. In the past, liposuction surgery would require patients to have blood transfusions because of the significant blood loss in the liposuction aspirate. 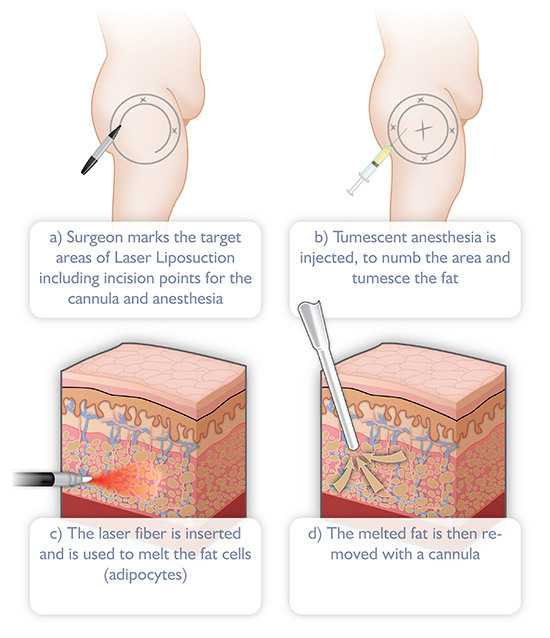 The tumescent liposuction technique, reduces blood loss, eliminates both the need for general anesthesia and intravenous narcotics, as well as sedatives. Because doctors only make small incisions, and there is a large amount of fluid that must be drained out. Some surgeons may decide to leave the patients incisions open for the patients excess fluid to clear the body. Quick departure of the body fluids allows the incisions to heal quickly. Some doctors may suture the incisions just partially so that they leave space for the fluid to drain from the. Other doctors may delay suturing until all fluid is the drain, which is can be 1 or 2 days. While the fluids are flowing, dressing need to be often changed, and small self-adhesive bandages are used. However, there is disagreement on the effects of scarring with not suture versus swelling allowed by leaving the wounds open to drain fluid. Before a patient receives a procedure, no anticoagulants should be taken for two weeks before the surgery is administered. If sedation or general anesthesia is used and the surgery is is in the morning, The patient will have to fast from midnight the night before. If local anesthesia is used, there is no fasting needed. Smoking tobacco should be avoided for two months before surgery, as nicotine interferes with circulation and result in tissue loss. Bruins can be seen in people who smoke post surgery. The liposuction candidate and the surgeon will need to agree ahead of time exactly which areas of the body will b treated, and both discuss what outcome the patients should expect. A consent form is signed on the day of surgery. An antibiotic will be given to the patient about an hour beforehand or after the surgery. Photos are taken of the area that is being treated so the patient will have before and after pictures. The operating room is sterilized in a solution such as Betadine, which is applied to the relevant areas. Local anesthesia is injected into the patient, or a sedative may be IV injected or orally given. Incisions are small, usually a quarter of an inch. The patient will also have an IV fluid line since they will likely lose fluids along with the body fat. The doctors must keep the fluid level balanced. The medical staff will use monitoring devices to attached to the body to keep track of blood pressure, heart rate, and blood oxygen levels. The patient may feel scrapping or rubbing from the movement of the cannula. Usually, patiently can get up and walk around the same day and go home if he/she did not use a general anesthesia, although they may need assistance. Recovery is dependent on the extent of liposuction that a patient receives. Patients can return to work within two days – to two weeks. 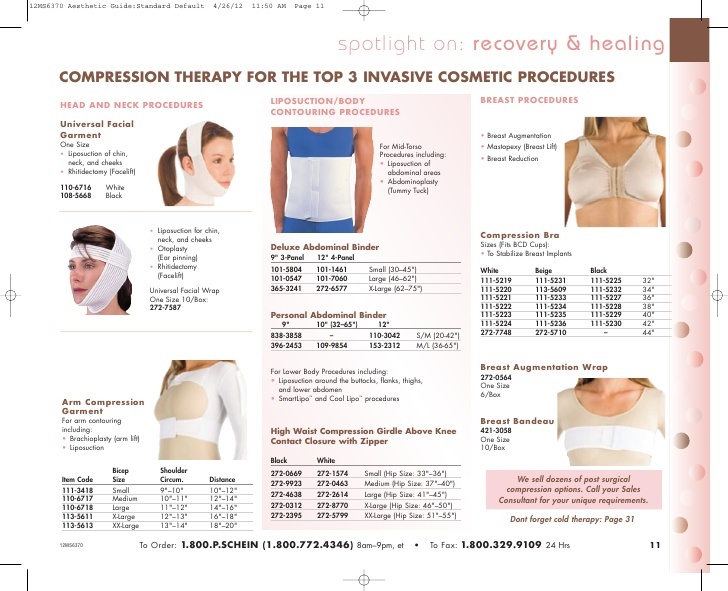 A compression garment can be removed and worn for two to four weeks. This garment must be elastic to allow for the use of bandages. If not-absorbent sutures are placed, they are removed between five to ten days. Patient pain is addressed with prescription or over-the-counter medications. The pain may last near two weeks depending on the procedure. Brusing will typically fade within a few days, but may last as long as two weeks after the procedure. Swelling can take up to two months to subside while numbness can last for several weeks. A patient may be able to resume normal activities within days or up to several weeks afterward, depending on the procure. The final results are typically evident after one to six months after surgery; The patient will see a notable difference within days or weeks as swelling subsided. Although the suctioned fat cells are permanently removed, If the patient does not maintain a proper diet and exercise regimen, the remaining fat cells can still become enlarge as fat stays in the body, from too many calories. Liposuction itself does not provide health benefits, the weight loss achieved is the factor can improve the health of the patient. However, doctors believe libation does not help combat obesity-related meatbolic disorders like insulin resistance. There are side effects from the procures, they are not considered complication, they are typically medically minor, they can be painful, unstable and enjoying. Bruising: this can be painful in the short term and should fade after a few weeks. Swelling – This should subside in a month or two. Scars – These vary in six, depending on the procedure and should fade over weeks. Scarring is partly dependent on the patients genetics. Some scar healing can take up to a year to heal. There are various factors such as limiting movement. As with any surgery, there is a risk that goes beyond temporary or minor side effects. Doctors will mention them during the consultation. By selecting the right patients for liposuction, doctors minimize the occurrence of complications. The likelihood of complications is increased when there is a large amount of fat that is removed. In the 1990s, there were some deaths of liposuction, and there were high rates of complications, nearly 5 out of 702 cases. Allergic reaction to medications of material used during surgery. Infection is possible with incised or punctured, bacteria can get into the wound and cause infections. Seromas, Sometimes entrapped liquid fat may accumulate under subcutaneous plain as seroma, small seromas will get absorbed during cannulization, but large aromas will need aspiration to avoid infections. Damage to the skin – Most surgeons will work through deeper levels of fat to avoid wounding the skin. The cannula can cause damage below the surface of the skin, and appears as spots on the surface on top the skin. Contour irregularities: sometimes the skin can look bump or wither when fat is unevenly removed or due to poor skin elasticity. Not all patients heal the same way, older patients will have slower recovery times. Sometimes small touch procedure. Atheroembolism and fat embolisation: liposuction is a low-risk procedure for thromboembolism, including pulmonary mary embolism. However, there is still a risk. Burns via the cannula movement can cause friction burns. The heat from the ultrasound device can cause injury to the skin or upper-level tissues. Lidocaine Toxicity – when wet or tumescent are used, too much saline fluid may be injected, and contain a high level of lidocaine. This lidocaine poisoning can cause tingling and numbness and eventually seizures, followed by reports or cardiac arrest and unconsciousness. If you are looking to get a liposuction. Do as much research as possible and talk to multiple doctors to get an idea of what your best options. You want to make sure that your goals are realistic and possible and you have a clear understanding of the outcomes and potential risk. ← What are Cluster Headaches?